Today is a travel day. The main Ketebul crew (Steve, Patrick, Drix) left Nairobi early to drive to Kisumu, while Tabu flew with Jimmy and Hunter to Kisumu (Jimmy and Hunter arrived from London on the 17th. 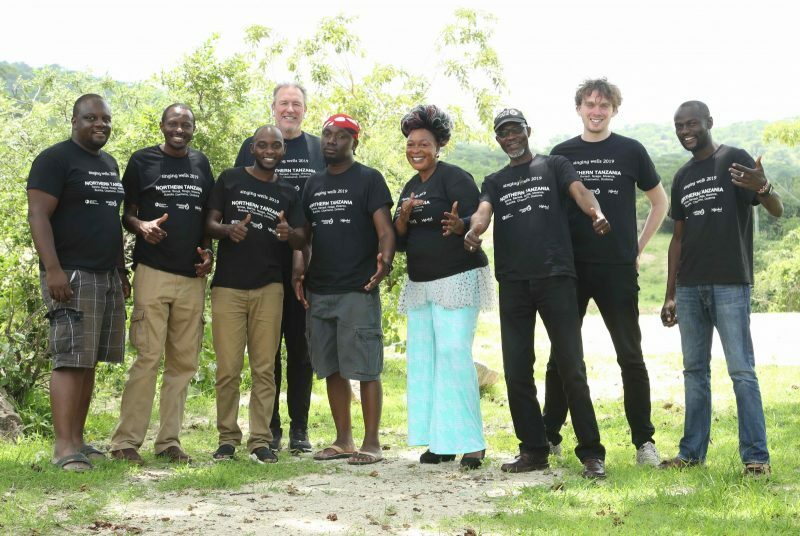 We all met at the Kenya/Nairobi border and after two hours, cleared the border and drove to Tarime, where we met Jackline Odhiambo Aringo (Jackie Akinyi), a Tanzanian musician who helped organize our trip (see our interview with Jackie here). We arrived at the Kifa Hotel late in the evening, ordered our ‘dried fish’ and crashed. This, our second major field visit to Tanzania, begins tomorrow. This is our second Field Visit to Tanzania. (Please go here for the first trip) For Singing Wells, a field visit is when we visit a specific region of East Africa and record musical groups in villages. On average, we do one field visit a year, recording roughly 20-25 groups, and a 100-125 performances. We have roughly 1,000 videos on line. Our general setup for a recording is: a) Steve is in charge of audio and we typically have two general mics for the group and 5-6 specific microphones for singers and musicians, b) we have three video cameras operating – one wide shot for full performance, one close up to capture details of instruments and one roving camera to provide a second angle on the performance and c) we interview all group leaders to understand group musical styles and background, instruments and songs. In almost every village, we struggle with spellings of songs and instruments as these can differ by village and by band. We fully recognize that there are multiple spellings out there, but we defer to the band leader in almost all cases. ‘Freestyle’: We work hard to give our groups the space and freedom to sing and dance as they would during a village performance, but there are constraints. Typically we want the group to be seen by our wide camera and many of the musicians have an attached microphone. While generally this isn’t a problem, there are times when the group is constrained. So, we often do another take which we call ‘free style’ where we take our cameras off tripods, and our video team simply follows the group around as they dance and sing. This provides a much more free feel, although it does mean we can miss part of the performance, so we always try to do two versions of the song. Magic Moment: For many songs, we find there is a moment of amazing percussion, or dance, or other instruments that we want to isolate and record, even if only for a minute. So we will ask the group to re-do one section of the song and sometimes we’ll mic this this differently. Influences: We often conduct a field visit with an influences artists, a leading commercial artist that we hope to inspire by the music of their region. When the ‘spirit moves’ we will do a song with our influences artist and the group. Our ‘output’ for a field visit is a set of videos that we post on our website, Facebook and Youtube that reflects the performances. When we initially publish our field reports, these videos aren’t available, but as we complete videos, we will provide links from the songs to the videos.